A new adaptive wavelet-based circuit simulation algorithm has been developed within ICESTARS. Subsequently a prototype of a wavelet solver for circuit simulation has been implemented in the framework of the Infineon in-house circuit simulator. To realise the new wavelet-based circuit simulation algorithm, the unknown voltages and currents from MNA description are expanded into a wavelet representation, which is determined as solution of nonlinear equations derived from the circuit equations by a Galerkin discretisation. The wavelet representation is adaptively refined during the Newton iteration until the prescribed error tolerances are met. The resulting approximation requires almost minimal number of degrees of freedom, and in addition the adaptive approach enables very efficient numerical computations. For the validation of the new wavelet algorithm the set of typical RF circuits representatives, namely the oscillator, mixer and the amplifier, was used. Accuracy and performance of the wavelet solver have been sucessfully tested against highly optimised transient analysis algorithm. The results of the simulations indicate that the wavelet based method may achieve the performance of the standard transient analysis. Since the relatively new wavelet approach has a large potential for optimisation, the ICESTARS partners are is optimistic that wavelet analysis will be a valuable tool for circuit simulation in the future. From a mathematical point of view, simulations of oscillator circuits are most demanding and challenging. Modified nodal analysis (MNA) for these circuits leads to typical differential algebraic equations (DAEs) instead of ordinary differential equations (ODEs). This restricts the choice of numerical integration methods which can be used to solve the systems numerically. A further difficulty is that oscillator systems show nonlinear behaviour causing the signals at different frequencies to influence each other. 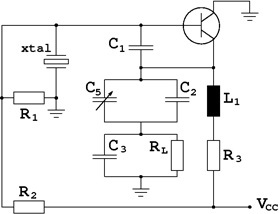 This causes problems, when coupling different time scales.The oscillators may also exhibit long transients before entering their periodicc state. Though these transients are not in the focus of the project, a time integration method cannot avoid computing them. The ICESTARS simulation results are presented for free running oscillators like a Colpitts oscillator, voltage controlled oscillator (VCO) and Pierce quartz crystal oscillator.